The Oregon Effect: Does Team Apparel Impact Recruiting? If you’ve been watching college football recently, you may have noticed that some of the nation’s most recognizable programs have become, well, unrecognizable. This is because college football programs are increasingly opting to change their teams’ uniforms on a year-to-year, if not game-to-game, basis. Many pundits have tied this phenomenon to the University of Oregon Ducks, college football’s original uniform tinkerers. The Ducks have long been associated with striking uniform designs that prominently feature the school’s colors—green and yellow—along with black, white, and grey. However, in recent years, the Ducks have been trotting out a new uniform combination for every game. How and why is a school with a distinguished athletic department deciding to become the chameleon of college sports? What is "The Oregon Effect?" The first part of this question has a very simple answer: Nike. Like many schools around the country, Oregon has a lucrative apparel contract with Nike that outfits its different teams. However, most of these schools—at least until recently—have not permitted Nike or other leading brands to significantly alter their uniforms every year. 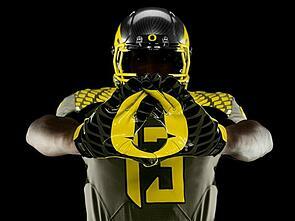 Conversely, the Ducks have given Nike an unprecedented amount of freedom in regards to football uniform designs. As a result, Oregon’s football games function as testing grounds for Nike’s newest football products and designs. This last point partially explains why the school has chosen to grant Nike such liberties. Since Nike provides Oregon with the newest and most innovative gear, recruits look at the Ducks as a school that can offer something others cannot. The uptick in recruiting—according to ESPN’s college football RecruitingNation Class Rankings, the Ducks have been among the top recruiting teams over the past four seasons—has led to on-field success. After winning the Pac-10 (now known as the Pac-12) conference championship in only three of their previous 54 seasons, the Ducks have now won three of the last four. They have been to a national championship game during that time and narrowly missed competing in a couple of others. Thus, the Ducks have turned a seemingly inconsequential aspect of a college football player’s experience—his uniform—and made it into a focal point. Other schools are now trying to catch up. For example, the Texas Christian University Horned Frogs, an up-and-coming program that won the 2011 Rose Bowl, have added red to their traditionally black and purple jerseys. The school has said that the change reflects the blood-squirting capabilities of horned frogs, but there is also a football-oriented motivation for this modification: recruiting. Student-athletes want to play in the best gear, which is apparel that is both high-performing and flashy. Some schools might offer enough athletic, academic, and social benefits to recruit well without conforming to this new trend, but most cannot. At most colleges around the country, if you want to lure recruits to your campus, you need to focus on making your teams’ apparel both appealing and ground-breaking. In other words, you need to start taking the Oregon Effect seriously.